I realize my title, “Our Most Relaxing Vacation Ever” has the sincere ring of a theme paper topic from school days. My first thought when I put pen to paper was of Ralphie and his classmates when their teacher announced their assignment to write a theme paper on the movie A Christmas Story. Oh NO! Not a Theme Paper! Well, this isn’t a theme paper but if it were, I must say that I would enjoy writing it because of the trip down memory lane! I’d like to share the most relaxing vacation we have ever taken. Isn’t vacation supposed to be relaxing? It was July 2009. My mother had just come to live with us in June because my Dad had passed away in January. My husband, my Mom and I were excited for this little vacation. 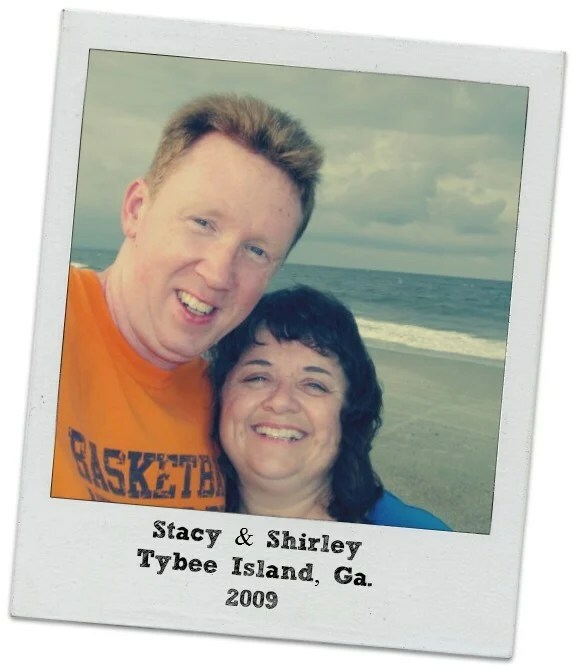 Mom’s best friend met us at Tybee Island, Ga. My husband had actually proposed to me, 13 years earlier, on the beach at Savannah which is only 4 miles from Tybee Island. We had 3 separate rooms at the Savannah Beach Inn. This was our first ever stay at a Bed & Breakfast so we were excited about the experience. The B&B was a turn of the century, lavishly furnished Victorian southern home. The wrap-around porch was both welcoming and cozy. Mom’s room on the main floor had a door which opened to a sitting area on the side porch. My husband and I stayed in the only room on the third floor, called The Marshall Suite. It had a huge picture window facing the ocean about one block away. Our second day there, it rained most of the morning which was awesome to us! 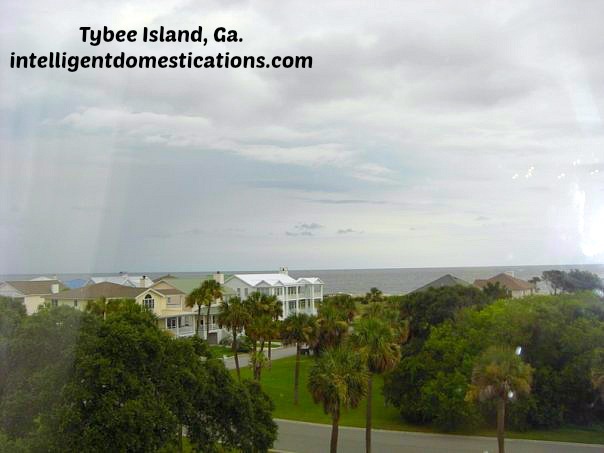 My husband slept late while I pulled a chair over to that big picture window and watched it rain over the ocean. After a deliciously prepared breakfast of strawberry pancakes served up with conversation by the Innkeeper, my husband and I enjoyed a day of touring Tybee by bicycle. Tybee Island is only 2.75 miles long, and mostly flat. You could potentially ride the entire island numerous times each day! We stopped to enjoy some local shops and even pushed our bikes along the beach. The innkeeper arranged for the bicycles to be brought to us at the B&B and they were even picked back up from the B&B at no charge to us. You simply cannot get better service. 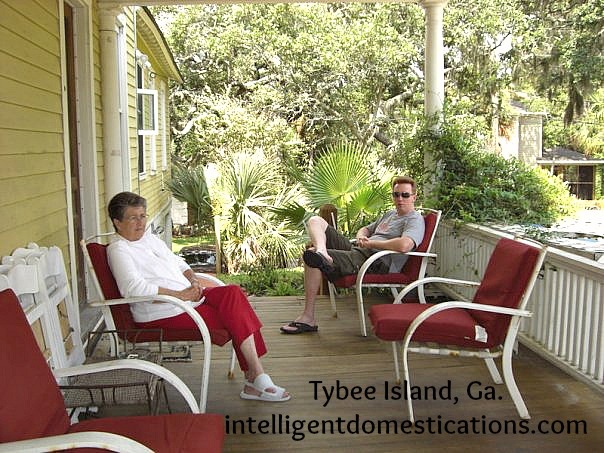 We have not been back to Tybee Island since this trip in 2009 but we have never ceased to enjoy reminiscing about how relaxing it was. Last year we came home exhausted after packing too many activities into every single day of our vacation. The Savannah Beach Inn is under new ownership and now called Surf Song Bed and Breakfast. The décor is more modern but quite inviting. Those marvelous porches are beautifully decorated and beckoning. We are talking about going back there. Wouldn’t you?! What made this trip so relaxing? We planned absolutely NOTHING for an agenda! There aren’t many ‘touristy’ attractions at Tybee to blow your money on. Just relax! Sitting and visiting with one another on that wonderful front porch! What is the most relaxing vacation you have ever taken? This post contains affiliate links designed to support this blog financially when a purchase is made after clicking one of the links. Thank you in advance for your support. Sounds like something I would have enjoyed too. Not sure why people go on those BUSY vacations. I think sometimes folks are just trying to see everything they can a vacation city. I much prefer the relaxation. We have done both. Oh, that sounds amazing! I LOVE Savannah, but my husband has never been! It would be a great trip, for sure! I LOVE Savannah also and am looking forward to returning soon. I very much enjoy exploring that old cemetery. That sounds like a wonderful vacation indeed! Staying at a B and B would be fun! We never have. My parents did once and they loved it. I seem to always have an agenda. I need to try a vacation without one. I bet it would be nice. Families taking children on vacation tend to make an agenda a little more than couples vacationing alone. You simply must go stay at a B&B, it is marvelous! Sounds like fun! I always look forward to our family vacation each year, but I really look forward to the vacation when it’s just the hubs and me. We don’t have an agenda, either, it’s all about some R&R! Sounds like fun, Alli! We are not in the habit of taking a family vacation with our children and grandchildren but I’d like to! We may have to plan that.